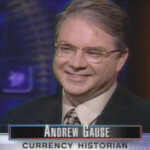 Andy Gause is one of America ’s foremost experts on the history of US currency. President of SDL Numismatics in Hawthorne, New Jersey, and member of the American Numismatics Association, he is the author of The Secret World of Money and Uncle Sam Cooks the Books. Over the past two decades he’s been an invited guest on thousands of radio and TV programs across the country.